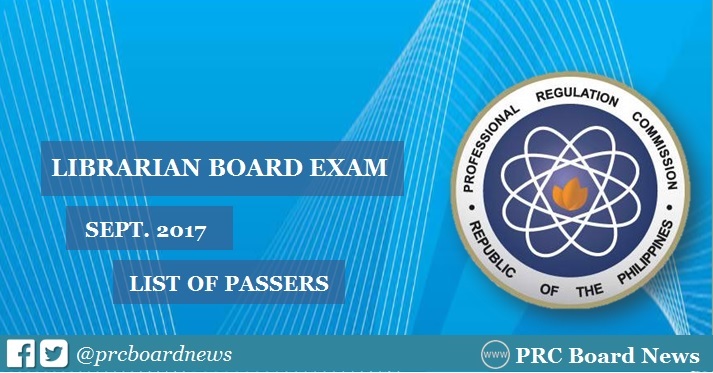 MANILA, Philippines - The Professional Regulation Commission (PRC) and the Board for Librarian released results of September 2017 Librarian board exam today, September 25 or in 2 working days after the last day of exam. The complete list of passers, top 10 (topnotchers), top performing schools and performance of schools are available on this page as announced online. UPDATE: 545 out of 904 passed the exams. PRC administered the Librarian board exam on September 19 and 20 in the cities of Manila, Baguio, Cagayan de oro, Cebu, Davao, Iloilo, Legaspi, Tacloban and Tuguegarao. The Librarian board exam covers the following subjects: library organization and management (20%); reference, bibliography and user services (20%); indexing and abstracting (15%); cataloging and classification (20%); selection and acquisition (15%) and information technology (10%). According to PRC Resolution No. 2016-1019, the target release date of the recent Librarian board exam results is on Monday, September 25 or in 2 working days after the test. As September 21 was declared "national day of protest" in time for the 45th anniversary of Martial Law, it is also possible that results would be released on Tuesday, September 26. In the September 2016 exams, results were announced in 3 working days. PRC named 738 out of 1,140 who have passed the exams. In the April 2015 exams, results were also released in 3 working days. A total of 349 out of 742 successfully hurdled the exams.